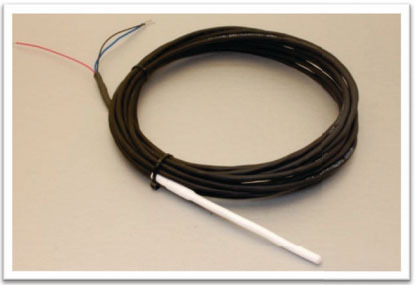 The thermistor temperature sensor is a small thermistor enclosed in a weatherproof housing. It is suitable for measuring air and soil temperatures with a datalogger. The fine-wire thermistor is ideally suited for taking measurements of surfaces or small samples where even a narrow field of view infrared radiometer may not be suitable due to the integration over its conical field of view. The small size also provides a more rapid response to changes in temperature than larger sensors. The sensor is rugged and can be repeatedly pushed into plant tissues with tweezers. The wires are flexible and less sensitive to breakage than similarly-sized fine wire thermocouples.